Fewer gnats today and 31 miles. Nice morning for a ride. I did hills. I still am not liking hills but I am riding where there are hills. Biking Day today. Ran into a few swarms of gnats. Yuck. New pastor's first day today. I think he is well received at this point. I hope this is a good step in the right direction for our church. We have had some rough things for a good number of years. The weather has been pretty interesting. I think those hurricane's affect us too. Good Work out today. Now I need to get moving and get stuff done at home. About time for me to get off my computer and get moving. DId find a recipe to try for sausage dish. Rode my bike this morning. It was breezy and cool but I managed some 10 and a half miles with hills. Our weather has been something so cool, to cold even over night but highs in the 80s. However I want to get into shape and this should be the secret. Tomorrow is even windier so will be a day at the gym. So though the weather is perfect for biking today was a gym day because I need to lift and I can't swing biking and lifting and a shower before work. Today's folly is I forgot my regular bra so I am wearing a sports bra with my work clothes. Probably not the worst thing but . . .
looks like there might be a couple new faces around so I am going to start posting here again. Medium bike ride today. Just over 10 miles which would normally be a low mileage day but I rode a route with more hills so I am saying medium. Supposed to be windy tomorrow and maybe Tuesday as well. I don't generally ride when it is windy. My son, of 25 years, is home this weekend so I am baking banana bread for him to take home for his freezer. I have been mostly staying away from making many treats but . . . He is young and actually looking pretty thin right now. Working hard at keeping up with the garden produce. Apples came in yesterday. Not very many this year but I am making sauce with what there is. Well there is not much news. The placement in South Africa didn't work. They were advertising, well within the SIM network a position that really isn't available. At this point we are pursuing an opportunity in Malawi. South Africa's communication was pretty slow so I am hoping this round goes quicker. I am thinking a couple of weeks. It's really hard to stay motivated and keep completing the classes and reading the books we need to be right now. In the meantime I am working on getting in shape as well. Ideally I should be lighter before we go. I am about 8 pounds from the minimum goal to meet the guideline for bush ministry. I don't really technically need to be there but it seems advisable. Also I have had the issue with my sciatic nerve and that is starting to resolve with solid exercise, lifting, stretching and losing a few pounds. That is a blessing. Lori, how are things going? Would love to hear more about your placement and all that's going on. I've been reading and typing notes from a book for our pastor - Turnaround Churches by George Barna. Our situation is probably similar to what many churches experience, in that a cultural change in the area in which our church is located has taken place over the years and it's hard to know how to effectively reach the community. A lot of churches slowly die when this happens, but I know this weighs heavily on our pastor's heart and he's seeking God's guidance. Has anyone else experienced something like this? Still waiting. We got some information and need to get more. Now I am thinking about my house and getting into better shape physically. Feels like an uphill battle. WE flew this time around. We accepted and waiting to hear about placement. We are committed for a two year term with hope to be able to renew and be on the field longer. Much to do for preparations and waiting to hear about placement. 1st inquiry is to work in South Africa in a group of ministries. Lori, how long will it take you to drive to NC for SIM? It sounds like a great mission organization and I look forward to hearing how everything goes. Praying for a safe trip also. My daughter is with CMF - Christian Missionary Fellowship - based in Indiana. Her particular work is with a mission under the CMF umbrella called Globalscope, which plants campus ministries around the world. She's just returned from 8 years leading a ministry in Germany. Seems like spring is sticking here now. I have moved a lot of plants outdoors. That means I am hoping it stays. We are mostly in spring most days here in W. WA. Guess I took a sparkation. Cold blustery day here today. Start of a cold week. All plant growing will be indoors for a bit now. The hip is what it is. It's not arthritis its a sciatic nerve issue. long car ride for Easter didn't do it any favors. It's bouncing back though. I will stretch pretty quick and then walk a little more and then to bed. It's been a beautiful day here today but . . . Cooler weather is settling in for the next few days now. I need to keep all my plants in for a bit yet. I got some geraniums at the garden show. I am putting them out during the days and bringing them in at night for a bit yet. Sorry to hear about your hip. For some reason, I wasn't aware of this thread. Still struggling with food this week and with moving enough. Today my hip is iffy again. I know stretching more helps a lot. Home from a busy weekend of food and fun with family. Too much food, but I did get some exercise in. Now my daughter and SIL got their running in. Made some Easter treats I found on pinterest but first I had to go three places to get the ingredients. Some places are sold out of some Easter candy and I had a hard time finding the woven square pretzels I wanted. Did get those made and clothes washed and some knitting done. Was a cool day here today. Supposed to warm up some and stay warmer. I might get outside and uncover my perennials and start working in the bed. SIM is a pretty big kid on the block in foriegn missions. At this point SIM is just three letters. Originally they were the Sudan Interior Mission. They have gone through a few mergers and transformations and for a while SIM stood for Serving In Mission. We will go where they send us but my heart is in Africa. If it were ideal we would be working with and running managing a home/rehab facility for girls brought back from being on the streets either begging or in prostitution. Doing training and discipling. However there are other options and it will depend on what is available and where the greatest need is. We both have library skills and I have a lot of craft and homemaking skills. I could teach many crafts including sewing and tailoring, cooking, home management, etc. One option presented to us a while back was to be in a guest house ministry and be the welcoming and facilitating people for short term teams coming in and also being librarians at a seminary. We shall see what happens. It's still a long ways to go to get into the field. That's great news, Lori! What does SIM stand for? And do you have a particular place in mind, or will it be wherever the board sends you? Please keep sharing as things progress. It feels like I spent all day in the kitchen, but I'm sure I must have done something besides cook. The overall result is great because my son is eating healthy and Dwight is basically eating what I prepare for Drew. Also, Drew's glucose levels have consistently been under 150 for over a week, so hopefully his surgeon will recommend closing up the wound on Thursday. Now, if I only had our income tax finished! So here's my big news. My husband and I are applying with SIM to be midterm international missionaries. We have sent in so much information but today we finally got an email that said the official invitation to SIM start is on it's way. That means initial approval. SIM start is a time for the board to get to know us and us to get to know them and an official decision will be made as to whether or not we proceed as candidates. Wow, I hope things look up. Son's can be something. My son has not health issues but he is not always the best at making good decisions. I am past my sciatic issue I think and mostly past my cold. I am wondering if I am left with permanent sinus infection but I am muddling along. Lori, I'm so glad you are continuing to post here! I had the best intentions of keeping up with everyone until my world got crazy back in February. My son went to the ER with an infected cyst on his lower back and gangrene was discovered, resulting in major surgery. This was caused because he had, for no good reason, just stopped taking his diabetes meds some time ago. He's serious about getting his numbers under control, thankfully, and I'm doing a lot of caregiving and cooking since he moved in with us. We see several doctors each week and I oversee his wound vac and twice-daily antibiotic infusions. But good progress is being made and his spirits are high. I'll catch up with everything here as soon as I can. cold and hip are improving. Now I just need to get back on track with my exercise and we will be good! I am not thrilled but life is good. Still no peanut butter in my house. I am still struggling with my hip. Was a lot better but Friday and Saturday were long car ride days and that didn't sit well. It's better today then it was yesterday though so hopefully soon. Have not gotten any peanut butter yet. I did get active minutes today. I was able to do 30 minutes on the elliptical without hurting and 5 slow slow minutes on the treadmill at an incline. I am still not getting close to 10,000 steps though. Peanut butter is on sale. I am wondering if it's safe to bring it back into my house. I tend to eat too much. It's been gone for a week or so. Yes I do get that feeling. I am a proponent of chatting here instead of down in the dieting and maintaining tips forum. If any one new comes by I would think they would post here. So I am posting most days. My hip/leg is still sore but it's getting better. Do you ever get the feeling you are talking to yourself? I've been reading what you say, but haven't commented. Saw the doc. She says my self diagnosis is correct and checked a few things to make sure I was correct. Keeping on Keeping on. So all day yesterday I thought this painful leg/hip was getting better. Not so much today. We shall see how the day goes. I have been stretching this morning but it's sore when I walk or stand at all. On the bright side the wind has blown on down the road and it's bright and sunny this morning. I have my Awana class to teach tonight. I am not sure how that will go if I can't move much. It's still windy but the sun is shining and it looks cheerful out. I am headed to the Y soon to see if I can manage cardio of some sort and a litting session and good stretch. It's incredibly windy and snowing in my world today. Can't say I am in favor of this change. Walked outside for a bit today! 3 bookcases and 4 cupboards today and some plants and such moved and taken care of. I have a large selection of books to think about getting read to ship to Africa which will free up more space. Maybe I will be able to have people over and entertain in my basement again soon. I am still waiting for real chat to move here. Cool this morning but warmed up nicely today. Supposed to be upper 40's tomorrow. Thinking about hiking outside some. We shall see. Probably depends on the mud. Another cool or should I say cold day. It was 13 this morning and a fresh inch or so of snow. My husband has been busy scraping the driveway every morning as we seem to wake up to a little fresh snow each morning. Good exercise for him I guess. I got a walk in before work today. I got up early to hit the used book sale at the library. Wow what a crowd. People were buying crates and boxes full of books. I don't get it. I only looked for a few minutes. I picked up 5 books. Three will go to Africa and 2 were for me. I am hosting a Book Challenge and one of the catagories is a book purchased at a used book sale. I have 2 to pick from now. Stuffy this morning and want to go on a revolt, However I just don't have time. Listening to my bird rattle his cage and eating my breakfast. Wishing it was warmer today and realizing that the warmth of the weather for the time of year makes me a bit scared about climate change. I am still struggling with sinus headaches, at least I believe and hope that is what it is. Looks like we are to get another round of unseasonably warm weather coming up around the weekend. Hoping to capitalize on that by getting some outdoor cardio in. Not in tip top health today. Whatever is going on with my sinuses seems to not let up. Found that if I am not carefull fitbit counts steps while I wind yarn into balls. I think I am still doing pretty good. I am slowly plugging away at the basement. Been cleaning the basement. Well sorting and moving stuff so I can clean is probably more like it. I have too much of too much stuff. Wondering how much exercise I really achieved doing this. by passed the donuts today! I am also doing well on steps and stairs. Yes I did eat not one but two Raspberry filled Bearscat donuts today. Much more relaxed today though it will be a full day. I need to stop and pick up turkey burger meat to make barbecues and then home to cook it and the soup that is in parts up and clean up the kitchen and be ready to host bible study tonight. Still trying to figure a snack out. What a day. I said I would teach friendship bracelets for a discovery zone class at church and have a lot more kids then I bargained for so besides teaching I spent extra time getting ready and on clean up. I also made beef stew and cooked up a pot full of chicken to make into soup and went shopping and worked a short shift at work. I am glad every day isn't this full. I am trying to cook up food to take to a family weekend this coming weekend. Was probably even a little warmer today. I got some work done on my bracelet class for church tomorrow. I am tired and draggy this evening but I did hang in there and get my 10,000 steps. Not 11,600 like yesterday but I am not thinking that is an every day goal. I was hovering around 40 and sunny here this afternoon. Might fine day for Feb. I know this can't last but I sure do like it while it's here. We have a bright sunny day, but it is also frosty. Found some lemon grass tea at TJ Maxx too! Another nice day in North Dakota! Got pretty windy this evening. Made lots of cutout heart cookies and decorated them up. They are all to be given away. I am getting more and more active. I just need to manage my intake better. Kevin says that he is done planting plants outside because after a month I get tired of them. I do like the perennials though! We are pretty today but it wont be as warm today and then tomorrow we get back to the 30's for a day and then warm up again with some rain. No wonder we are all sick around here. I went to see the dr yesterday for my annual check up and he was this head stuff too! We probably had two to three inches total snow yesterday and over night. We have had a lot, though it was mostly that the whole month of Dec. dumped on us. More has been disappearing then falling for a while but we will still be looking at possible snow into April. We are supposed to have warmer weather again starting in a couple days. Not spring but thawing temps during the day for a few days. Today was going to be my rest day but I just realized I have dental work scheduled tomorrow so I will fit in some workout time today and rest tomorrow. I am messing with my plants a lot now and would really like to go out and buy plants. That is what happens when it gets closer to growing season. I want new plants. Thanks for the welcome back Lori. You've certainly had a hard winter this year....all I've read about is your snow!! Surely Spring is around the corner? It's been sunny here today but chilly and damp. We have spring bulbs coming up now and plants growing side shoots... But it's still good to have the central heating on! Sounds like you had a lovely vacation, great to have you back. I am trying hard to be a fitbit nerd these days and to catch up on various crafty stuff. Ah good to see the Cafe being used again...it got abandoned because nobody was posting so JanetR & I were using another thread to chat along on. We've had a lovely holiday in Tenerife. The apartment was up a very steep hill and we walked so many miles in the 2 weeks we were there. The weather was good but not warm enough to go swimming. I'm in Florida! Enjoying a break from the German winter, although I do love the snow --- as long as no driving is involved. Great idea to renew the Cafe...My SP time is very limited these days but ai do love this team! Hit my goals again yesterday and working at getting there today. I am almost at 6000 steps right now. SO looks good! I follow zulily sales and they have the charge HR 2 for half off today. It's a really good deal even with shipping and handling. I ordered one for my husband. I have been looking for a wrist heart rate tracker that wasn't 300 dollars for a while. There are other options as well now but I am pleased with my fitbit as I really like the app. Yesterday I did learn one way to fake it out. I was pealing carrots and cucumbers and it counted strokes of my peeler. I know it misses some steps if I am carrying stuff or pushing a cart. I am wathcin to see how accurate it is. I am convincd of it's utility for heart rate though. Lori you have a more advanced fitbit than me. I want to upgrade on of these days. We are colder this morning but just at freezing. We haven't killed out the bugs either! We have complained but really we haven't had much winter at all. Of course anything can happen before April 15 is what my husband goes by to plant. JanetE should be back today or tomorrow. I'm leaving for the weekend but will be back on late Sunday night or Mon morning! Wow Yeah for whoever started a new spark café thread. It's down right cold here today I know it was 3 degrees when I left for work this morning. I am kind of pleased a punch with my fitbit. It gives me a list of active minutes for the day. But if I go to the app it tell me my heart rate zone, how many minutes are in fat burn, how many cardio, and I am assuming there is a third category I am not reaching at this point. It just gives my competitive self something to aim for. Good workout for me today. With my lingering cold all but gone I can breathe well enough to work a little harder. Lori, I think our weather will turn cooler this weekend, but we just haven't had enough freezing temps this season to kill off summer's insects. Janet, hope your eye appointment goes well. About this time last year, I had cataract surgery and it made such a big difference. My doctor also put an implant in that made my distant vision almost perfect. Can't read without glasses, though, so I have to keep them close by all the time. Good idea! We are colder today too while still sunny. Getting ready to go to an eye doctor appt for my yearly checkup. Our cold snap started today! I liked the spring like weather. Our weather has been approaching spring-like weather but we are supposed to have a cold snap soon. 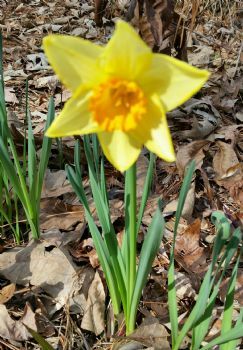 It's still winter, but some of our jonquils started blooming! These little guys probably won't last long because we'll have more cold weather, but I'm enjoying them at the moment. Anyone else having springlike weather? Janet started Spark Cafe as a great place for us to chat and I updated it because it's been pretty inactive for a while. Hope many of you will join in as you can. Welcome!